Travel between your light and dark with magnificent hemp oil and the succulent scent of royal pomegranate. Fate sealed by six pomegranate seeds, Persephone is maiden of springtime before her yearly descent to reign as Queen of the Underworld. She is both young and wise, she is above ground and below, she understands all perspectives. Wild Women’s Persephone soap is made with gentle plant oils retaining all the naturally created glycerin, you will notice the difference in your skin. 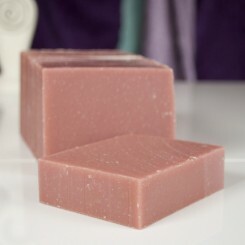 Colored with shimmering natural mica, Persephone is simply gorgeous and scented with juicy royal pomegranate. Ingredients: olive oil, coconut oil, distilled water, palm oil, sodium hydroxide, castor bean oil, fragrance, vitamin E oil and natural mica.